Maybe we didn’t have any respect for facts, but we had volume. We didn’t really need the Russians. We were doing fine at self-destruction all by ourselves. One of my favorite movies, and one of the best science fiction movies ever, was released in March, 1956. I think I first saw it at the Highway 50 Drive in, but I wasn’t yet one so my memory is a little hazy. 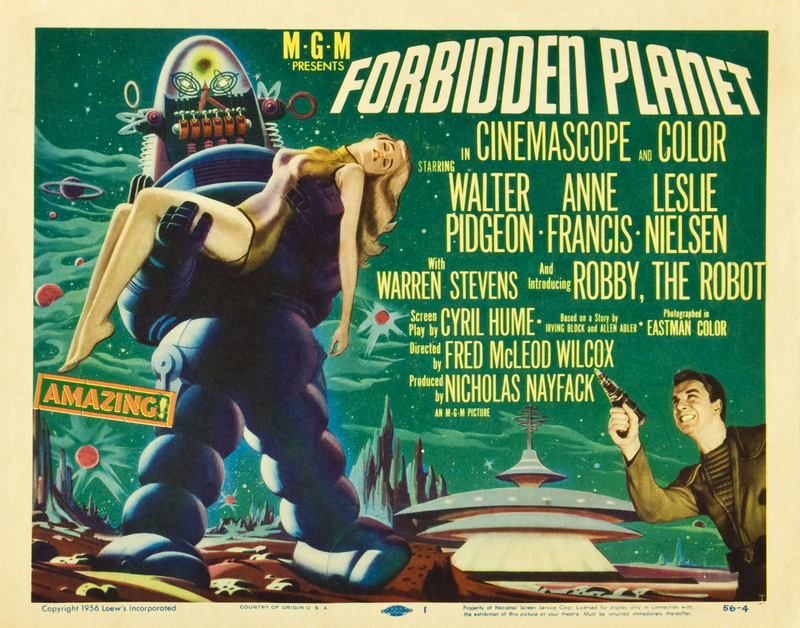 Forbidden Planet had it all: dazzling special effects (courtesy of Joshua Meador, lent to MGM by Disney), an A-list cast with Walter Pidgeon and Anne Francis, a robot, and Lt. Frank Drebin as the ship’s captain. It was a great film with a great message. It was also prophetic. I won’t bore you with all the details. OK, maybe with a few. It was sort of/kind of based on Shakespeare’s The Tempest. It introduced Robbie the Robot to the world. Ten years later he would warn Will Robinson of danger…danger. Leslie Nielson was once a serious actor! Some of the film’s props were later used in an episode of The Twilight Zone. That should be enough to hold you until you can get to Wikipedia. The main point of the film was that the Krell, former inhabitants of planet Altair IV, had created a machine that could turn their thoughts into reality. It was their crowning achievement, freedom from instrumentality. But their freedom destroyed them. All their subconscious fears and desires, long hidden from their rational minds, rose up in the night, took physical form, and slaughtered them all. And then humans came. I watch Forbidden Planet whenever it comes on, but I can’t help but see similarities between the Krell and us. There are countless things that I have thought over the years, but a strong sense of staying employed and alive prevented me from saying them out loud. But then Facebook came. And Instagram. And Twitter. People love to talk, so we did. All those previously unmentionables leaked out. It started as whispers, so soft they could barely be heard, like tears in the rain (sorry, that’s from a different movie). But the whispers drew other like-minded whispers that turned into murmurs, then to a rumbling, thunderous roar. People were angry! People were scared. And when they found out other people were just as angry and scared, that knowledge fed the anger and fear and a mob was born. The beast was loose, and the Krell screams had long died in the quiet of space where no one can hear you scream (damn it! I did it again).. We couldn’t save ourselves because we didn’t know what exactly threatened us. Some high minded folks told us about facts, but then we began to question what, exactly, a fact was. In some sort of Rod Serling moment, facts could be anything. You could make them up, and people would believe what they wanted to believe, whether it was true or not. Our screams were now filled with potential facts, quantum facts, that may or may not be true in this particular universe. So we turned on each other. Maybe we didn’t have any respect for facts, but we had volume. We didn’t really need the Russians. We were doing fine at self-destruction all by ourselves. And one day, when cats or octopuses rule this planet, they will find our roads and our plastic. A lot of plastic. Perhaps they will wonder about our extinction. They might even make a movie. We won’t be able to tell them how our greatest achievement, intelligence, ran headlong into our greatest enemy, fear. And fear won. Our whispers became razors through the power of our machines, and the razors became axes through our shares. But we’ll be sorry. Sorry for our weaknesses and all the whispers that should never have been uttered. We’ll also want to apologize for all the plastic. Recycling scared us, too.